Lettuce burnout? 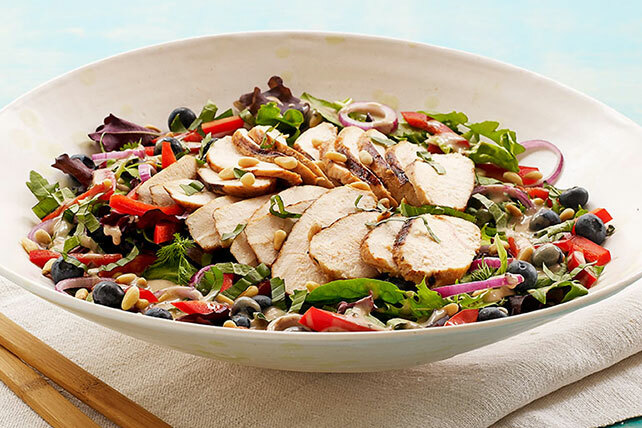 Check out our tasty blueberry-balsamic spin on grilled chicken salad. Buh-bye, boring. Hello, fabulous. Pour 1/4 cup dressing over chicken in shallow dish; turn to evenly coat both sides of each breast. Refrigerate 10 min. to marinate. Meanwhile, cover 4 large plates with salad greens; top with peppers, blueberries and onions. Gradually whisk remaining dressing into mayo in bowl until blended. Refrigerate salads and mayo mixture until ready to use. Remove chicken from marinade; discard marinade. Grill chicken 6 to 8 min. on each side or until done (165ºF). Cut chicken into thin slices. Drizzle mayo mixture over salads; top with chicken, nuts and basil. Prepare using KRAFT Lite Raspberry Vinaigrette Dressing.